Blepharoplasty or eyelid surgery is now the most popular facial plastic surgery procedure after rhinoplasty (nose surgery). The popularity of this procedure reflects the importance of the eyes in perfecting overall appearance. In fact, two-thirds of adults consider the eyes to be the defining feature of the face. If you are unhappy with the appearance of your eyes, you may want to consider blepharoplasty to improve your look and boost your confidence through a safe procedure with minimal downtime. If the eyelids begin sagging into the field of vision, a functional blepharoplasty, or eyelid surgery, may become necessary. This procedure can be covered by medical insurance if it is visually significant. Dr. Polonski can determine this by checking the peripheral visual field with an instrument called the Humphrey Visual Field (HVF) Analyzer. An upper blepharoplasty will tighten the muscles and tissue as well as remove excess fat and skin from the upper eyelids. This can eliminate the drooping of the skin into the visual field, improving peripheral vision tremendously. 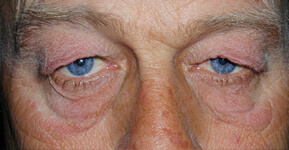 If the upper eyelid is being treated, an incision is made along the natural crease of the eyelid. Once the incision is made, Dr. Polonski may reposition fat deposits, tighten muscles and tissue or remove excess skin in order to leave the eye looking younger and refreshed. 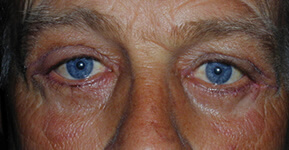 For the lower eyelid, an incision is made just below the lash line in order for excess skin to be removed. After the blepharoplasty procedure, Dr. Polonski may recommend applying lubricating ointment and cold compresses to help aid the healing process and minimize side effects such as swelling, bruising, irritation or dry eyes. The eyes may be wrapped in gauze after the procedure as well. Patients can usually return to work within two days, but should avoid exercise and strenuous activities for at least two weeks. Swelling and other side effects usually subside within two weeks after surgery. Dr. Polonski will give you specific instructions on how to care for your eyes after surgery.